People who know me (Alec) know that I tend to wear my stress on the front of my shirt. It can be spotted a mile away. Not that I’m mean or snap at people, just that when I’m stressed I tend to create more of a busy atmosphere around myself. Busy somehow in my mind correlates to productive. This couldn’t be further from the truth. The past month or two have been a bit, how do you say, nightmarish when it comes to planning out and executing tasks needing done at our renovation homes. Finding a good Drywaller was half the battle. Once we did, they delayed the project two weeks and when they did finally start, the put in one day and never showed back up. We were searching all over again for a new Drywaller. When we did find one, it took two weeks for them to start. As you can see, this pushes timelines back, delays contractors and puts our completion date way off. But, contractors be damned, we finally have everyone on the same page and moving along fast. Here are a few tips I have for when sh*t hits the fan and you find yourself in a rut. Remember why you started in the first place - it’s easy to hang your head and imagine an easier life. Reality is that things aren’t easy and if you’re in the business of flipping homes because it’s “easy” then you’re definitely not flipping homes. Find a quiet place or something to do that helps you remember the reasons you started in the first place. For me, it’s standing quietly in the middle of the madness and seeing the homes for what they will be and not for what they are. Rally the troops - get all the contractors working on the home together at the same time. Let them know your worries and concerns. Tell them your expectations. Empower them to take initiative and make the project their own. It’s ok to be vulnerable in this instance because it shows the contractors you’re in need of help and they are the ones to help. Genuinely good people look to help others and if your contractors are good people, they will want to help. Get out of their way - Not too long ago, a very good friend and entrepreneurial mentor told me that if I feel like I’m the bottle neck in the renovation process then I most definitely am the bottleneck. Meaning, get the steps set up, confirm the contractors know what to do and when, then get out of the way and let them work. The worst thing that can happen is if people are waiting on you (me). A four man crew gets more work done in a day than one person #betyoudidn’tknowthat. So when it comes to being the bottleneck, don’t be. Above all else, keep moving. Every day the house sits still and nothing is being done is money being thrown out the window. You owe it to yourself and any partner you work with to keep the ball rolling even if it’s smaller projects that take up time. Even if it’s a slow roll, keep moving forward! Now go out there and change the neighborhood! Few things in life really get my goat, but one of them is a constantly messy job site. Don’t ask my wife, but I like to think for the most part that my work space is kept clean. I typically end each day by organizing my tools, putting things away and tying up loose ends. Yes, there are days I forget or have to run out before completing this project but most days I do try my hardest to get the job site clean. You may ask yourself, why would you keep the job site clean if it’s a house you’re tearing apart only to put back together? Well dumb dumb, here are a few reasons why you should end your day by cleaning up your work space. It makes your work more efficient – add up all the minutes it takes you tracking down the Phillip’s screwdriver or looking for your circular saw. Add them up and see how much time is waisted just scouring the job site for what you need and you’ll literally LOL. You’ll laugh because those minutes add to hours over a week or month and before you know it, time waisted leads to delayed completion dates. You lose money in one way or another – Delayed completion dates lead to more money spent on utilities, interest on loans, payments to contractors. Not only that, a messy job site leads to lost tools, which means more money spent on things you’ve already bought before. Contractors who despise you – ask 10 contractors and 9 of them will say they prefer a clean job site and organized project home to work in. Not only does this make your projects more enjoyable than others but it also distinguishes you from the other competition. You’d much rather have a room that is clean rather than messy, right? Contractors feel the same way. They too can work more efficiently, keep track of their supplies and complete jobs faster (thus saving you the ole’ mighty dollar). It’s not rocket science nor is it a difficult task to complete. The only skill you need is diligence that’s not even a skill. Just plan to end your day 30 minutes earlier and use that time to walk through each room with a broom and dustpan. Clean up loose debris and trash and put your tools in organized piles. Once you do that, step back and take a look at a clean project. You’ll breathe easier and be more excited to come back the next day to work. When you’re starting from scratch with a house, it’s hard to know where to begin. Trust me, I spend hours and hours looking at layouts trying to figure out how best to optimize the space. But even after that step you can be at a loss when it comes to selecting finishes. After renovating multiple homes over the last year some things have come easier and I have “go-to’s” in the design process. However, each house is different for us and the design is also that way! There’s nothing cookie cutter about these homes, so the design can’t be either. So that brings us to a few helpful tips I’d like to share with you. If you are ever lucky enough to rebuild a house from scratch these might come in handy. It’s a lot of work but truly an amazing experience. Select your lighting and flooring first. When you’re starting from the ground up yes it’s always good to have some inspiration photos on hand, but when it comes to execution of those ideas I’ve found it’s always best to start with selecting the flooring. I find this to be true especially with selecting bathroom tile that fits into my design and price range. It’s very easy to go over budget in this area, so shopping around and finding deals help! You may notice by pictures of our homes that I always try to find statement light fixtures. I feel that lighting can change a space dramatically. In an open space like our Shady Creek Ranch, we added multiple can lights to brighten the space however it didn’t over power the visual look of the space. We then went for large focal light fixtures for the kitchen and dining area to draw the eye into the space. Matching too much can get you in a design rut. Whether it’s with cabinets, textiles, paint color or fixtures, don’t stick to just one design or color. Mix it up! Having variety in the design will allow you to make changes down the road to one room at a time without it looking too different from the other spaces. Be eclectic. If you love a piece and it speaks to you, use it in your home. Create an outdoor element that is functional yet adds to the curb appeal. Our 10th street cottage had a lack luster screened in porch when we bought it. Living in the neighborhood we knew how nice it would be to open that space up and have the ability to talk with neighbors as they go by. Wanting to have that space be more of a social aspect lead us to adding an exterior ceiling fan and open porch railing. It also made the house much more welcoming! We all know how many choices there are out there for cabinets. Shaker style, flat face cabinets, glass doors, gray, blue, pink. Whatever your fancy is, you can find the combination with cabinets. But, we sometimes run into the situation where we don't know whether to replace or simply update with a fresh coat of paint. Lets take for instance the Park Ave. Palace. The kitchen had a good layout for a smaller home but definitely needed some updates. Countertops had cuts, nicks and showed it's age so replacing that was a no brainer. Surprisingly, the cabinets were old but still in good condition. Of course, it was older construction without the soft close hinges and didn't have the modern touch like newer shaker style cabinets would provide. Deciding if we should replace or not weighed heavily on a few questions needing answered. What was the primary goal of the renovation? Would replacing add value to the home? These questions can be easy to answer in some cases but difficult in others. So, take a trip in my mind to figure out how we handled it. What was the primary goal of the renovation? - The goal of our renovation was to get the home looking as best as it could. We understood it wasn't the prettiest home on the block or the one with the most character but changing the cabinets would give it an advantage over other homes. We didn't want to pour a bunch of money into it because we knew we wouldn't get it back if we would resell the property. Therefore, we leaned towards painting the cabinets over new ones all together. What was the cost of both options? 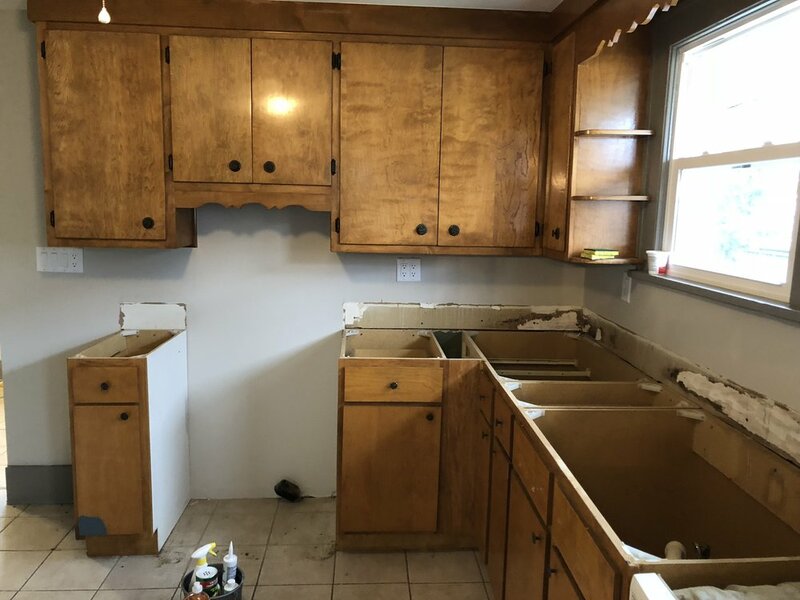 Paint vs. replace - New cabinets can get pricey. From lower cost cabinets at Ikea to custom made cabinets from specialized cabinet makers the cost can vary anywhere between $400 - $40,000. Based on the home, the location and the goal of our renovation, we would have been willing to spend $3,000 - $4,000 for well made high quality cabinets. Painting the cabinets would cost $300-$400 and would wouldn't require removing the cabinets. Makes more sense than replacing; another point for repaint. 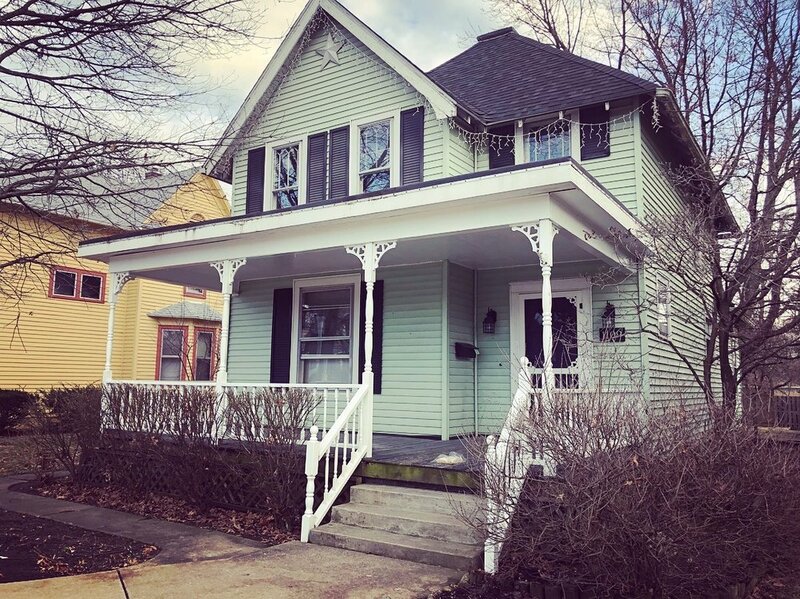 Would replacing add value to the home? - As we mentioned above, cabinets can be a costly renovation. Think about it for a second. 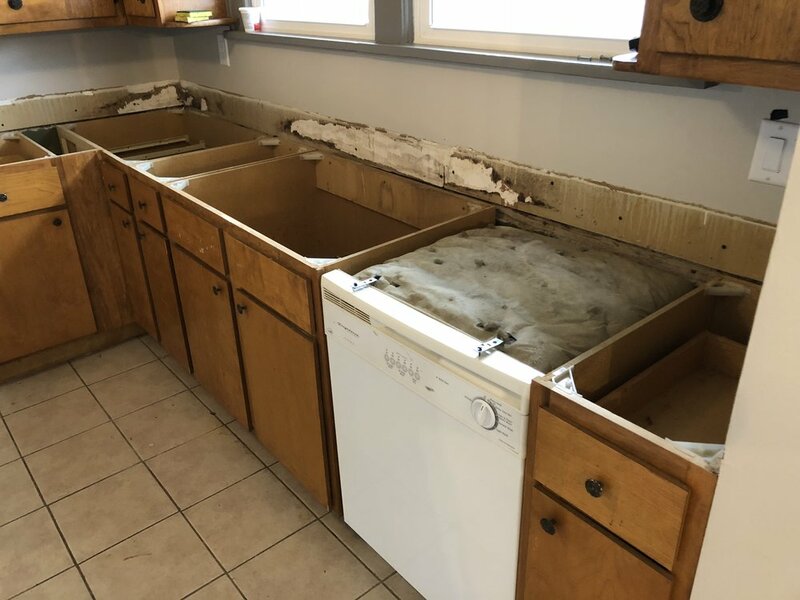 You get new cabinets then most likely you'll need to get new countertops - add $3000. New countertops mean a new sink, fixtures, plumbing lines, etc... - add $600. Put all that on old paint? No, fresh coat of paint, maybe even backsplash $800. See how things can add up? With that said, kitchen remodels yield 92.9% of the cost spent which out performs a lot of other renovation investments. Sounds like it's a bust on this one. When all is said and done, we looked at these three questions and went with repainting the existing cabinets and adding countertops. Out of the three questions, two of them pushed us to repaint more so than replace. Given the fact that we are keeping the home as a rental and didn't want to invest heavily upfront on a full kitchen remodel we were very comfortable going through with repaint. We are currently in the process or repainting and would love to show you some progress pictures. Countertop goes in next week and this home is ready for some new tenants! Those who know me know that I have no problem stepping outside of my comfort zone and trying new things out. I moved to Chicago away from family to experience new opportunities. I went to hot yoga this past week to give it a go. I even opened a door for an IU fan. All these things put me in uncomfortable positions. However, they all helped me grow as a person. Chicago opened my eyes to a big city while showing me how large public companies run. Hot yoga made me sweat profusely and opening that door for an IU fan forced me to smile when I wanted to frown. This is how I looked at tiling. Ok, so I get it. Many DIY'ers do this and it's not that scary once you get into it. But, let me take you into my thought process for a bit. I'm a perfectionist on certain things. Finished trim, paint, landscaping... all things that are visible to the perspective clients looking to buy a home. Tile is no different. If it is wrong and uneven, people will notice. So, for as long as I could, I procrastinated on putting up a tile backsplash in the kitchen. Well, here is what I learned. 1) It's not that hard - yes, it can be overwhelming and I made a lot of wrong cuts but at the end of the day, I made progress and it didn't look so bad. 2) It will never be perfect - even if you can get the spacing right, the mortar mixed at the right consistency, the right tools, timing, humidity in the air, etc... the wall that your laying tile on isn't square and likely has a wave to it. Put it up anyways and do the best with what you have. 3) Jump in head first - this is the way I typically do everything and it mostly works out. Immerse yourself in the process because it's new and (can be) exciting. 4) See it as learning a new skill - not as doing a chore. Often times we get complacent in doing things we know how to do instead of looking for things we have no idea how to accomplish and figuring out a way to do it. The best part about learning how to tile isn't the end result, it's the journey to get there. Twitter that. If you need a little motivation to get started on a project that has you scared, watch this video and get after it!